Sale: 19 April, start 3 PM. Showing all 98 items matching your search criteria. 1. ZENITH, El Primero, chronograph. 2. 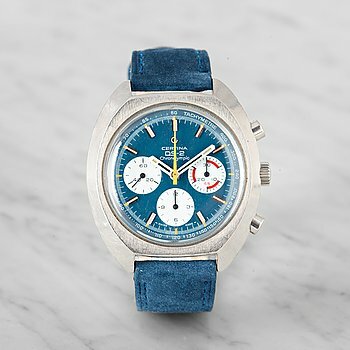 HEUER, chronograph, "Big Eyes". 3. 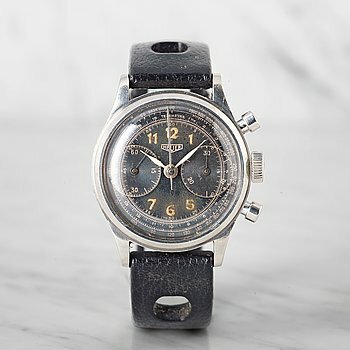 BREITLING, Navitimer Chrono-Matic, chronograph. 4. 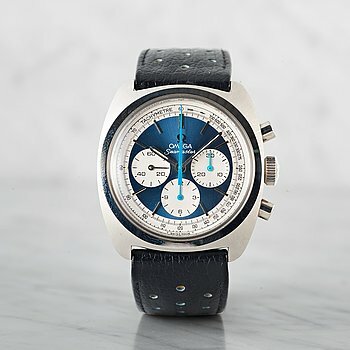 CERTINA, DS-2, Chronolympic, chronograph. 5. 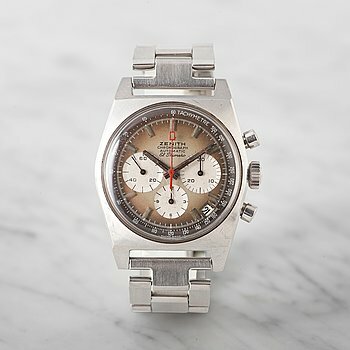 HEUER, Autavia, chronograph, "Viceroy". 6. 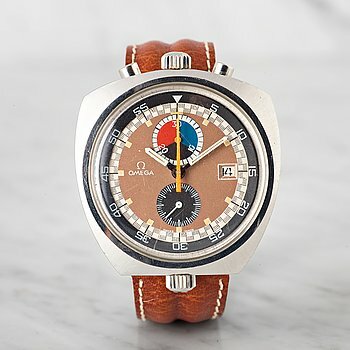 OMEGA, Seamaster, Chronostop, chronograph, "Bullhead". 10. 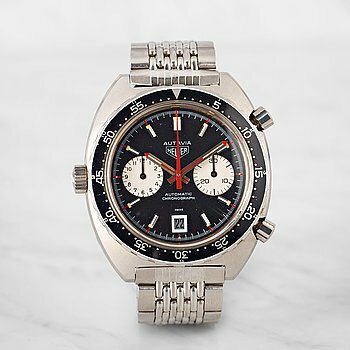 HEUER, chronograph, "Big Eyes". 15. UNIVERSAL GENEVE, Uni-Compax, chronograph, "Big Eye". 18. 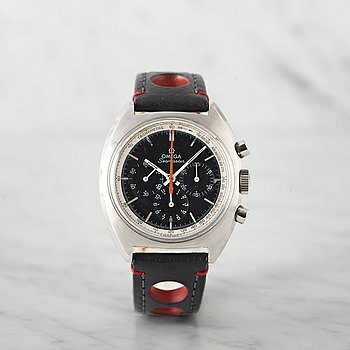 OMEGA, Speedmaster Mark II, chronograph. 21. OMEGA, Speedmaster, chronograph, "CB Case". 22. BREITLING, Navitimer, chronograph, "AOPA". 30. OMEGA, Speedmaster, chronograph, "Tropical dial". 35. OMEGA, Speedmaster, chronograph, "CB Case". 45. 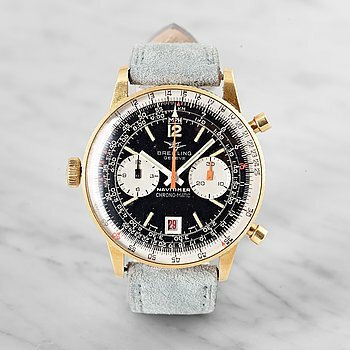 ZENITH Special, "Pilot Watch". 46. LEMANIA, Tg 195, 'Tre Kronor/Three Crowns'. 47. IWC, W.W.W., 'Dirty Dozen'. 48. LEMANIA, Tg 195, "Tre Kronor/Three Crowns". 49. SEIKO, "Tre Kronor / Three Crowns". 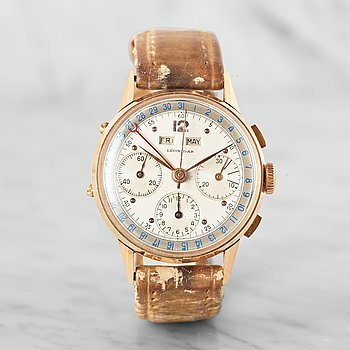 50. INTERNATIONAL WATCH CO, "IWC". 51. VACHERON & CONSTANTIN, "Art Deco". 52. PATEK PHILIPPE & Cie, "Oversized". 54. ALPINA - GRÜEN, 'Doctors watch'. 56. PATEK PHILIPPE, Golden Ellipse. 61. JAEGER-LE COULTRE, Memovox, Snowdrop. 65. OMEGA, Constellation Calendar Grand Luxe, "Pie-Pan". 69. ROLEX, GMT-Master II, 'Root Beer'. 71. ROLEX, Sea-Dweller, "Great White Mark III". 72. ROLEX, Submariner "Red Mark V". 73. ROLEX, Submariner, 'Meters First, Gilt dial'. 75. ROLEX, Explorer, "Gilt dial". 77. ROLEX, Datejust, 'Turn-O-Graph, Thunderbird'. 81. INTERNATIONAL WATCH CO, "IWC", Electronic. 82. VACHERON & CONSTANTIN, Overseas. 83. IWC, Mark XII Saab, 'Mellow Yellow'. 85. F.P JOURNE, Octa Quantième Perpétuel. 87. IWC, Da Vinci Perpetual Calendar, chronograph. 88. HUBLOT, F1™ King Power Austin, chronograph. 91. PATEK PHILIPPE & Cie.
93. JAEGER-LE COULTRE, Atmos, "White Fish Marina". 94. HEUER, Super Autavia Monte Carlo, "Triple Set". 96. ALEXANDER CAIRNS, 32 Waterloo Road, Liverpool, Marine Chronometer. 97. OMEGA, Speedmaster "Moon Crater Box". 98. PATEK PHILIPPE, Master Clock.